Peppermint bark is one of my favorite holiday treats. It is super easy to make, and fun to give. I wanted something that was simple to make, yet showed that I cared enough to create something homemade. I think that gifts that you create are the best ones to give, don’t you. 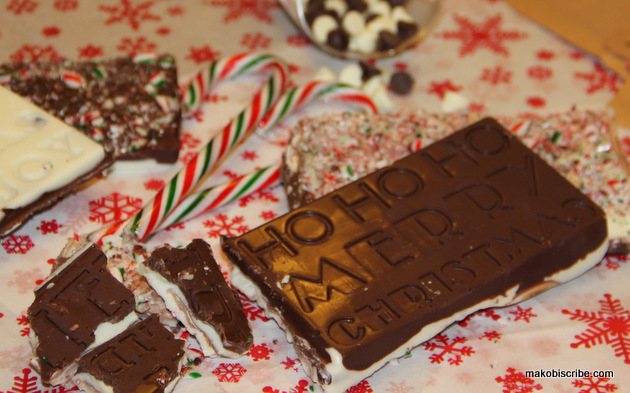 Here is my Peppermint bark recipe. The coconut oil is optional, but it helps to keep the white chocolate from seizing up. If that happens, just add a little more oil at a time. Pour into mold. I put three blocks of white on dark and then 3 with dark on white. Good Cook provided me with items from their Sweet Creations line to make this fabulous Peppermint Bark including the beautiful wrapping and packaging. 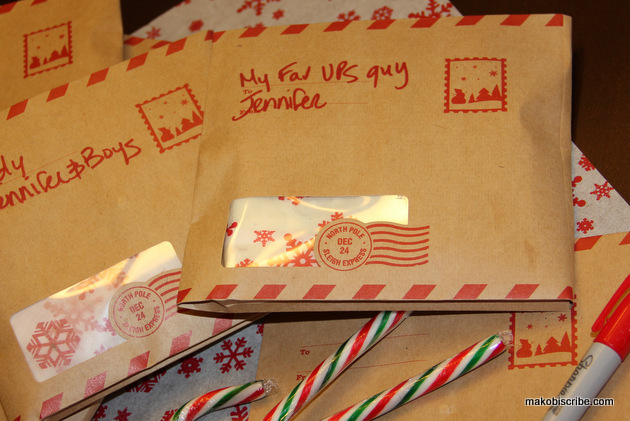 I receive so much mail at my house, I thought these would make the prefect gifts for my UPS, Fed Ex and USPS mail carriers. I loved how the gift parchment paper kept the chocolate bark from getting on the envelopes. It made such a nice, personal touch that each one of the recipients appreciated. It made me feel good to share my cooking talents with people who do a service for you and are so often overlooked. The holiday bark and brittle mold from the Sweet Creations line was easy to work with as it is made with genuine non-stick silicone. You really need to check out all of the cool things you can create and make with your family to give away this holiday season. You can purchase this for $12.49 off their website and get a free loaf pan with purchase. It is oven safe up to 450 F and can be used in either the freezer, refrigerator, or microwave. You can use this mold to make peanut brittle, mini-cakes and more. It is the perfect size for the holiday treat envelopes. Good Cook Sweet Creations seasonal bakeware–uniquely designed to bring new and creative ideas to the kitchen. “Sweet Creations are all about edible gifting, the cooks’ way of sharing! Make sure to check out the Sweet Creations Promotion that is now running on Facebook and Pinterest through January 2nd, 2013. You can also enter to win a Good Cook set like I received by entering the Giveaway Tools form below. Oh my god I typed yummers and it autocrrected. I actually have done this. I love bark of any kind but chocolate is hummers! I have never heard of the company mentioned here Good Cook? or Sweet Creations? I will look them up. Thanks. This is a great idea! I will have to bookmark this to check it out as the holidays near! Thanks. This looks so unbelievably good!!! 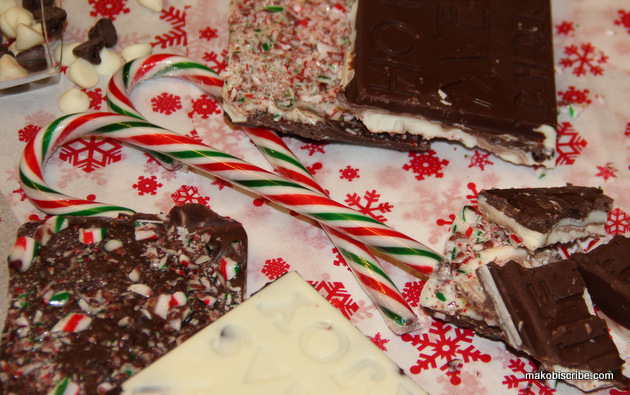 I just LOVE peppermint bark and enjoy making it each year. I used to make cookies each year for extra gifts for friends and family but have been making peppermint bark the last couple years. I wold love this sans peppermint, I like my chocolate straight up! That looks really good. I make this sometimes too, using white chocolate. What a wonderful recipe Jennifer! I think it would also be great during the holidays. Thanks for sharing. I like the 5 piece bakeware set and the flameless candles. I like the 3-Piece Saute Pan Set the most. gingerbread house cookie cutter looks wonderful. I love the 3D Gingerbread Cookie Cutter – I saw pictures of these little gingerbread houses on another site and thought they were so cute. I love to make little things like this for Christmas to make it special! My favorite is the Nonstick Fluted Cake Pan. I like the Ceramic 8 Piece Bake Set, Red. I’d love the pizza stone. Definitely the kitchen starter kit! I like the Nonstick Whoopie Pie Pan, 12 wells. I need the Ceramic Ramekin, 14 Oz – Red for baking! I do not have that size and its so affordable! My favorite product is the 3-d cake pans!! I could use the twister ice cream scoop. I like the Pizza Stone With Rack, 14.75″. I like the “Classic” Dutch Oven With Lid, 5qt. I like the Splatter Screen, 11-1/4″. My favourite product would have to be the bake and take cupcake carrier. I’m forever making a mess of my cupcakes and muffins when I stack them on top of each other in a cookie tin and if I put them in a ziploc bag the tops stick to the bag. It’s really hard to choose. I don’t do so much baking anymore because my kitchen is so small, cluttered and old. So its kind of depressing cooking/baking in there. But I can always use sauce pans or some neat gadget. I like the 2 quart Ceramic Square Dish! The 3D cookie cutters are so cool! I love the tree. Classic” Dutch Oven With Lid, 5qt. I’m loving the 3D cookie cutters. I’ve been looking for new cookie cutters and these are cool! The 5qt dutch oven with lid. I like the “Smart Choice” Saute Pan, 12.” It is large enough to do just about anything I would need it for. The cakes you can hang on a tree! I love the non-stick covered bake pan with built-in server. “Classic” Dutch Oven With Lid, 5qt. I like the brittle bark molds and the whoopie pie pan. Looks very fun! I like the Nonstick 5 Piece Bakeware Set. looks very useful! I could really use the EggSlicer. I really like the silicone pot holder! I love the Bake N’ Take Cupcake Carrier, 24 Cup! My favorite product Mixing Bowl 3 Piece Set, Multicolored. I like the 3D Holiday Ornament Cake Pan, 4 wells. Since we love sugar cookies at Christmas, I live the Christmas tree cookie cutter. The cookie cutter is really cool! I like the 8 inch round cake pan with cutter. The pasta server would be great. I could really use a good pasta server. it’s so hard to serve with a spoon. I like their black egg slicer! there are so many wonderful items! by far my favourite is the baking and pastry sets ..